Scanner Models included in VERTICAL PROMOTION! Become a partner today! Here is what you are missing! 10% VIR for NEW PARTNERS! 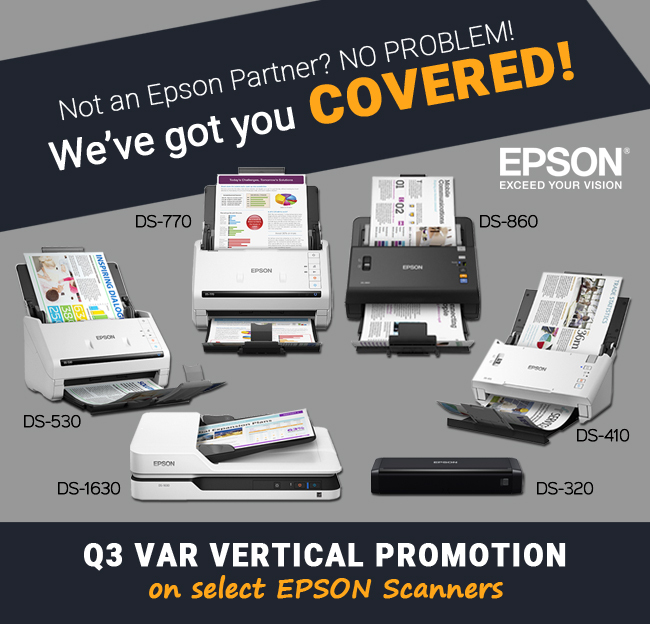 Click here to learn more about Epson's CapturePro program and apply today! Terms and Conditions: You need to be a CapturePro Partner to take advantage of the Deal Registration Program. You will need to provide end-user details to your sales representative and the request will be reviewed and approved by Epson, as long as another reseller did not apply for the same end-user deal before. Deal Registration will be valid for 6 months and can be extended if needed. And up to $200 SPIFF! EPSON and WorkForce are registered trademarks and EPSON Exceed Your Vision is a registered logomark of Seiko Epson Corporation. Copyright 2018 Epson America, Inc. NewWave & Epson reserve the right to modify/discontinue this promotion at any time, and without notice. *Available in all DS-Series Commercial Document Scanners except DS-30, DS-40 and DS-760. Specifications subject to change without notice. All of the ppm/ipms are based on letter size at 300 dpi. NewWave Technologies and the NewWave logo are trademarks of NewWave Technologies, Inc. All other trademarks are the property of their respective owners. © 2018 NewWave Technologies, Inc. All rights reserved.